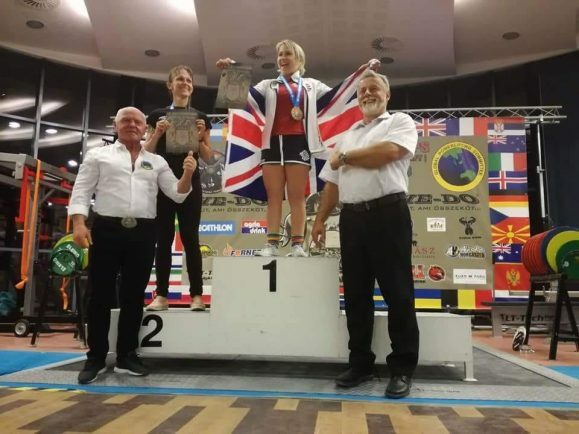 COFTON Hackett powerlifter Jules Davis claimed three records on her way to winning gold at the World Championships in Hungary. Davis secured the World, European and British records in the deadlift (M1 U60kg category) where she lifted 173kg, almost three times her own bodyweight. In total she finished with an overall score of 388kg, a new personal best. Davis was one of 1,050 lifters from 32 countries in Eger for the competition, with the lifting taking place over eight days. “It was a really tough competition,” she said. “Internationals are always such a different event to compete at and it’s so difficult to do what you know you can do. “I struggled with my squats to start with and that dented my confidence a bit. Davis didn’t have the best of build-ups to the competition as she pulled her hamstring, forcing her to take two weeks out and cut her training short. Bromsgrove physio Gary Jones, of Physio206, then helped Davis get back to a reasonable fitness level to compete. “On the day it was just a case of putting injuries at the back of my mind and doing the best I could under the circumstances,” added Jules. “I now have a world record certificate so I’m pleased with that. Davis also has her eyes set on the European Championships in May next year where she hopes to score a total of more than 400kg as well as claiming more records along the way. “For now, though, it’s back to the gym and time to put in some serious work to get there,” said Davis.